Warner Brothers has just revealed the first image of Anne Hathaway dressed as Catwoman for the upcoming The Dark Knight Rises flick, due out next summer. Her lack of cat ears is disturbing (a poster on Oh No They Didn't commented, "She looks like a random girl biker"), but I'm going to reserve judgement until I see more pics. Anne Hathaway looks so gorgeous in that photo. 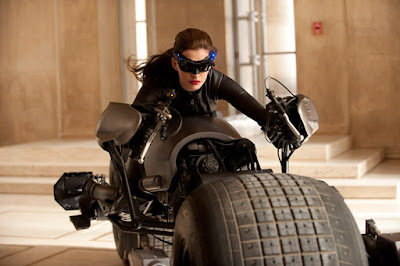 A catwoman. I am still partial to Julie Newmar as Cat Woman from the Batman show in the 60s and Eartha Kitt!